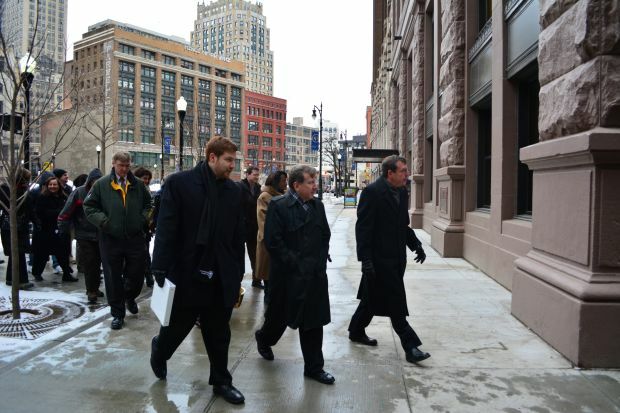 DETROIT (CNS) — Archbishop Allen H. Vigneron said the move from the old chancery to the new downtown home of the Archdiocese of Detroit two blocks away was akin to what Socrates discussed in Plato’s dialogues. But nonetheless, “it’s a chance to recapitulate (that reality) and start fresh,” he said. On Feb. 13, the 183 employees of the archdiocese’s Central Services officially moved into a new chancery building in the first major transition for the archdiocese’s headquarters in nearly 80 years. Archbishop Vigneron said the move is bittersweet: “I feel sad about leaving behind those buildings which have been such an important part of the life of the diocese,” he said. The former chancery had served as the archdiocese’s central hub since 1926. However, the changes are “working cooperatively, knowing what we are doing and being able to contribute to one another’s work,” he explained. Msgr. Robert McClory, moderator of the curia, noted that the consolidation of the archdiocese’s central operations from multiple buildings into one is not unlike what many parishes have undergone in recent years. Cumulatively, the archdiocese now occupies about 44,000 square feet on six floors of a 13-story building, or about a third of the nearly 150,000 square feet it previously occupied. Many floors had sat vacant in one of its locations. The $3.25 million sale of four buildings owned by the archdiocese was first announced to archdiocesan employees and the public in April 2013. At the time, Archbishop Vigneron said the move made sense financially, given the high cost of maintenance to keep up the nearly century-old structures. Some of the proceeds from the sales were used to help renovate the archdiocese’s new space, while the rest was to be put in a fund to which schools, parishes and other institutions make deposits and apply for loans. At the same time, “it is important for the headquarters of the Archdiocese of Detroit to remain in the city of Detroit,” the archbishop said, emphasizing a commitment to service and long-term presence downtown. The archdiocese is leasing five floors and the lower level of the former United Way Building in the city’s Capitol Park district. Built in 1895, it is Detroit’s oldest surviving skyscraper. Residential units are planned for the upper floors, part of a growing revival of development in the tiny enclave. While the archdiocese is among the first new tenants, plans and construction are in the works for several shops, restaurants and other developments. With the exception of the archdiocesan television station and archives department, the move means nearly all of the archdiocese’s central operations now will be together under one roof. The Catholic Television Network of Detroit has moved to Oak Park, where it maintains a broadcast tower. Msgr. McClory — who emphasized a theme of “Better Together” during the transition — said the archdiocese will also retain its long-standing relationship with St. Aloysius Church, which is adjacent to the former chancery. It continues to serve as the “parish church” for archdiocesan employees. While the archdiocese was originally slated to move last November, a pair of construction delays postponed the transition to Feb. 11-12. A special unveiling, prayer service and blessing was led by Archbishop Vigneron on Feb. 9, and the first day for employees in the new building was Feb. 13. According to Krista Bajoka, adjunct to the moderator of the curia, the building features new furniture and workstation styles geared toward better teamwork. For instance, employee workstations have new desks, ergonomic chairs and a uniform color scheme on each floor. Several employees still have offices, but the majority has transitioned to open-concept workstations for more efficient use of space and resources. Msgr. McClory said generic room numbers can be “rather boring and bland,” so each room has been assigned a saintly patron to bring more life to the setting and further indicate the building’s Catholic identity. There is the “Our Lady of Guadalupe Community Room.” The “St. Gianna Molla Medical Needs Room,” is available for nursing mothers and others who require privacy; it was named for the Italian doctor who chose her baby’s life over a cancer treatment that would have saved her own life. The “St. John Paul II Collaborative Area” is a fourth-floor meeting place that both honors the pope’s legacy and provides a space for conferencing. He said he hoped the chapel would express the importance of prayer before everything else. “Our ‘corner office’ is the chapel,” said Msgr. McClory. Wong Barnstead is on the staff of The Michigan Catholic, newspaper of the Detroit Archdiocese.